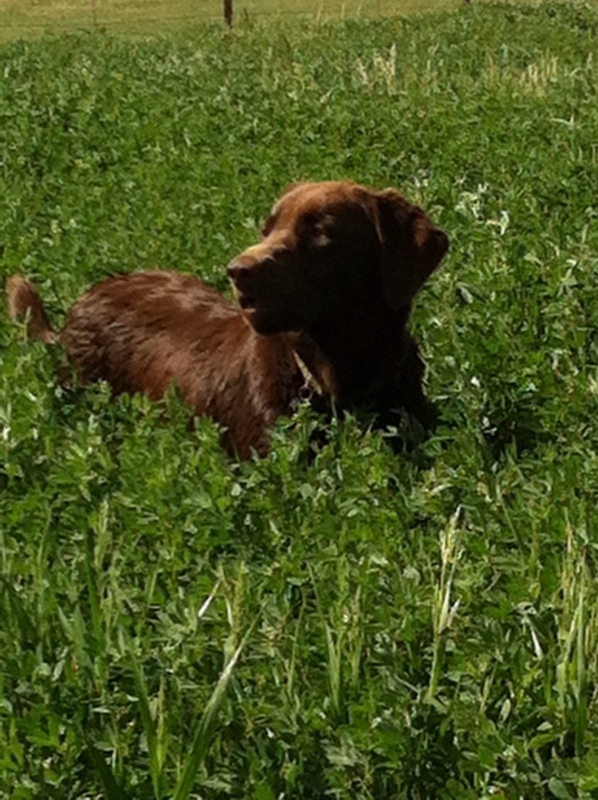 Many ranchers have the dependable Border Collie or Heeler to help in the daily ranching chores. 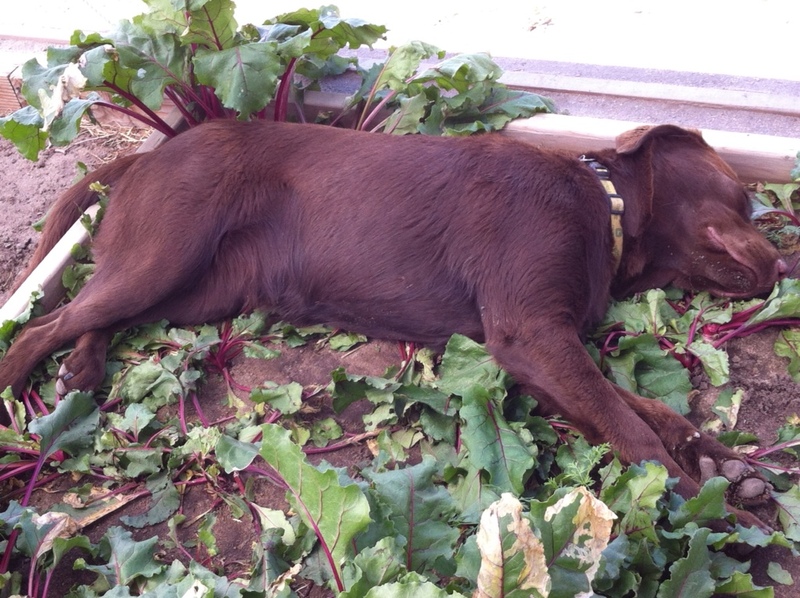 We have Lolli, our Chocolate Lab, whose enthusiasm for life is contagious. She waits by the door every time Kevin heads for his coat. 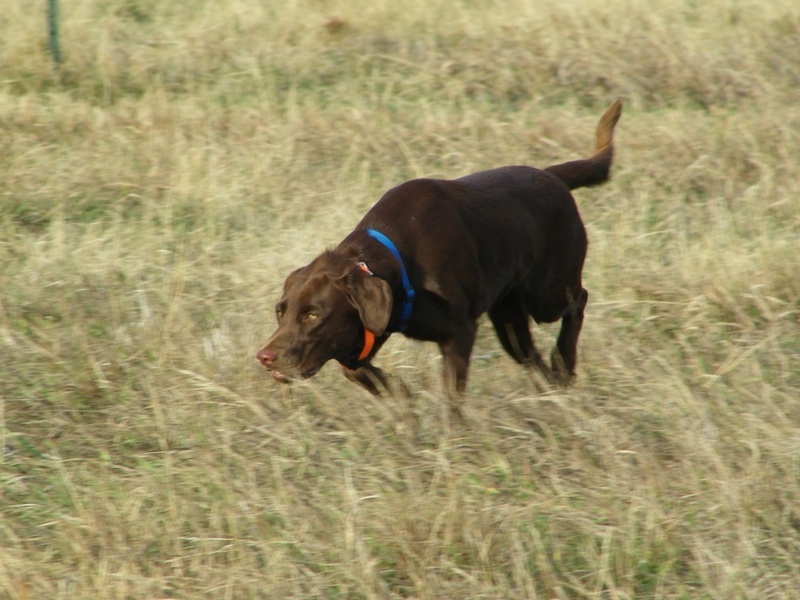 She hops up into the old ranch truck and heads out to check cattle and feed. Don't ever leave her home……she pouts. We had a crazy storm yesterday. The temperature dropped like a rock and the winds howled for hours on end. We both hoped that the momma cows would not think this a good day to calve, but some times I think the big change in the barometer must do something to them. Inevitably, a calf ends up being born in a storm. All looked good at about 6:00 pm as Kevin and Lolli fed. It wasn't raining or snowing yet. Everyone munched their dinner quietly. But by bedtime, the rain, now mixing with snow, had coupled with a driving wind as he and Lolli headed out to check the expectant mommas. A few minutes later, they were back. #53 had given birth and the little calf was alive, but wet and shaking. Out we went – Kevin hopped the fence and stole the calf away from a most indignant new momma cow. 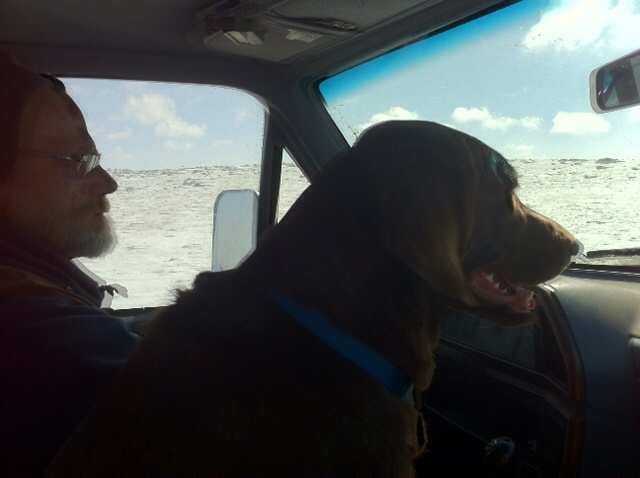 We jumped in the truck and headed for the house – rubbing the calf with towels and leaving the truck's heater on full blast. We carried the shivering little heifer to the kitchen where (thankfully) our wood stove was blazing. Lolli sprung into action. 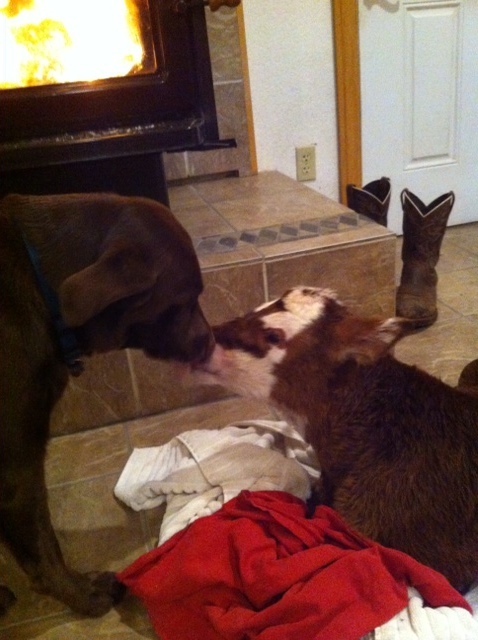 By golly – in her mind, if that calf's momma wasn't going to finish licking off this poor, shivering baby, then she was taking over. And took over, she did!!! We rubbed and Lolli licked. When we felt the calf was dry enough, we fixed a bottle of colostrum to hold it over until the storm let up. 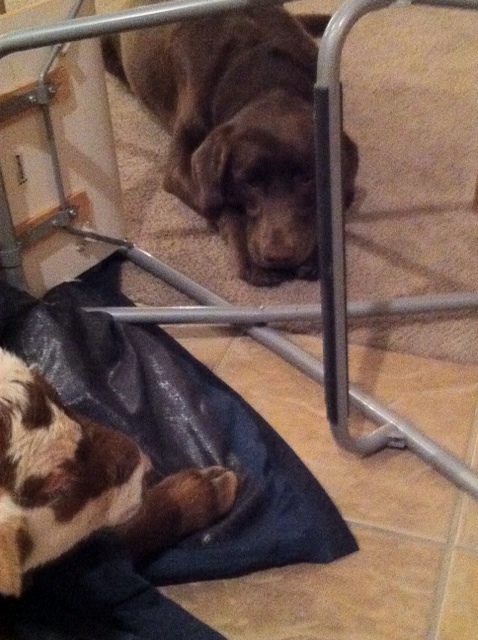 We made a makeshift pen around the calf so it couldn't get on the carpet. 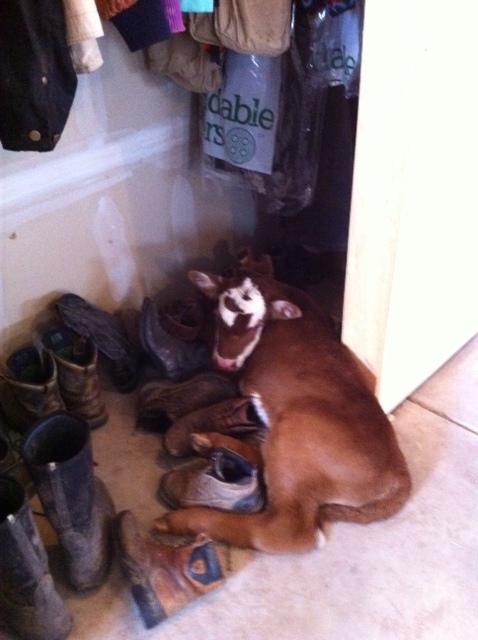 Lolli laid there forever – just wishing she could get in there and lick that calf some more! Well – with a sleepless night behind us and the wind still howling, we fed the little heifer some more milk replacer and put it out in the garage. She wobbled to the boot closet and proceeded to nap. I guess sleeping on the boots and shoes beat the cold garage floor. The storm has left us now. #53 and her newborn calf have been reunited. But, one time, this afternoon that little calf let out a beller…..I looked down at Lolli as she peered in through the panel. She whined, in response.